Hi guys! 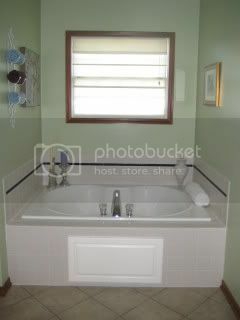 I am redoing my master bath. It used to have a huge mirror all along th edouble sinks. We took that out and added 2 ovals and shelves. Also added new knobs on the doors and new lighting. Next project is the shower doors, shower head, and the tile on the floor. Currently we have carpet. Question is about color. We used Behr's "rejuvenate" in satin. Do you think it is too "neon"? 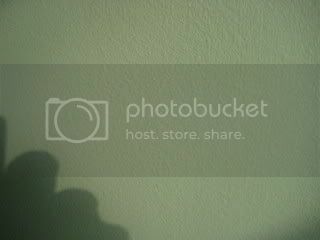 Sorry, just getting the hang of Photo bucket and resizing, etc. Let me know what you think of the color. I love the color, and that is the only brand of paint we use. You did a really nice job, looks great. Thanks! It is definately not done. I need more accessories and pics but it is a good start. Can you see my bedroom in the mirror! I just saw that! Ha! You did a beautiful job, the color is almost exactly the same as we picked. 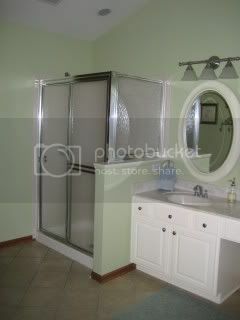 We didn't replace our mirror though, that will be done some time in the future when we do a complete bathroom remodel. Yes, I see the bedroom, lolol. After you mentioned it I looked at in in photoshop and I can even see the color/pattern of your sheets. That's really nice, Perriwinkle...I love the color. Thanks guys! A I finish more, I will post more. Perri~ I don't think it is too neon! I love the color! Thanks guys! I went and got more stuff today and I will be hanging it soon. I think I am going to paint the cabinets, even though my wood work is not off-white. I just hink that when I put down the tile, the paint would make it all fresh and updated. I will add more pictures soon! THanks for looking! I think the paint color is fine. 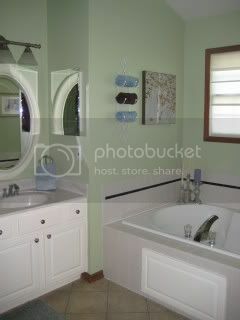 But with the Color being a " clear" color - your lacking a focal point within the area where your Mirrors are .. 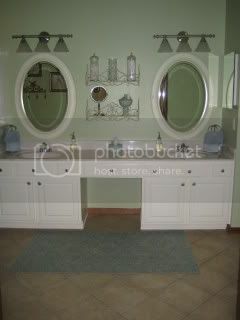 The Mirror Frames are not a focal point because they too are a Clean Clear white - does that make sense ? 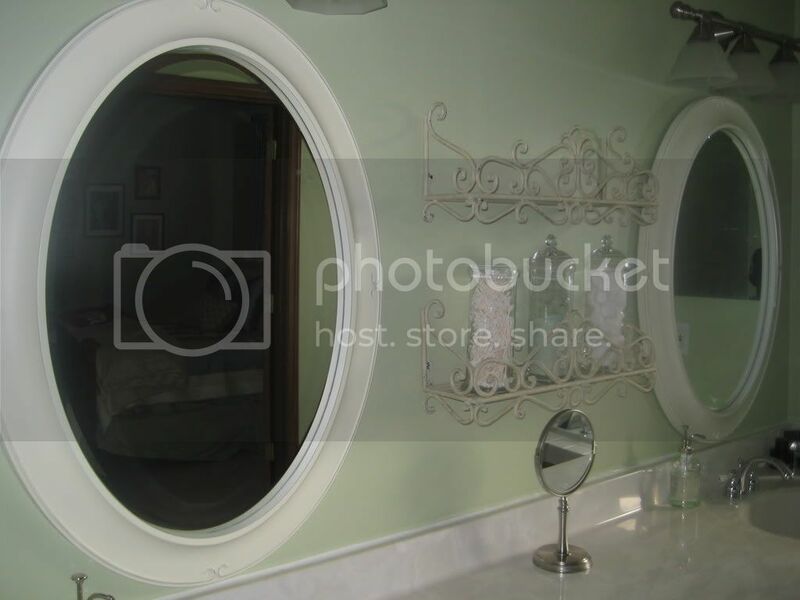 I think if you painted the frames of the Mirrors and added some depth it would be adding a little ...yet making a huge difference. I am right now in Renovation Hell ... I know how you feel. I think it has a lot to do with Too Many choices ..which deviates one from finding what is unique to themselves. Huggs - Great Job ..It is very pretty. 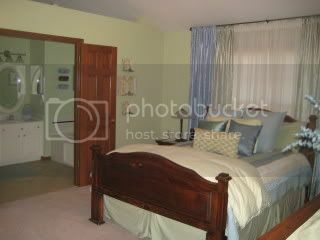 You just need a focal area thats all - to carry the Room ..when one walks in ..for that WOW .. Thanks Deenie! GREAT feedback. I will work on it! Well I finished the remodel and here is the finished product. Let me know what you think! We painted the cabinets to match the mirrors. We then added new knobs. THe flooring used to be carpet. Now we have all new ceramic tile on the diagonal. Page created in 9.809 seconds with 20 queries.